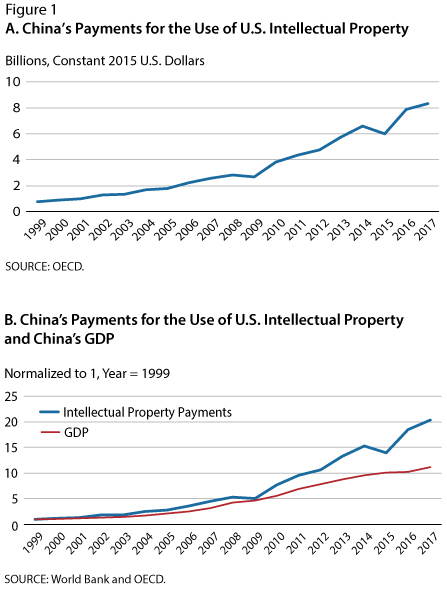 Given the growing trade tensions between the United States and China, and the economic implications of tariff increases, it is important to analyze whether China has taken steps to improve its enforcement of intellectual property rights. One way to do so is to look at data on China's royalty payments to the United States. In Figure 1A, we look specifically at China's payments for the use of U.S. intellectual property. The payments grew significantly, from $755 million in 1999 to $8.3 billion in 2017—more than 11-fold. Even more interesting, as shown in Figure 1B, is that China's royalty payments to the United States (blue line) grew faster than China's GDP (red line). These data may suggest improvement of China's enforcement of intellectual property rights. One cannot infer from the data, however, whether China is paying what it would be expected to pay for the use of U.S. intellectual property. The issue of China's potential misappropriation of U.S. intellectual property calls for further research. 1 Office of the United States Trade Representative. "USTR Finalizes Tariffs on $200 Billion of Chinese Imports in Response to China's Unfair Trade Practices." Press release, September 2018; https://ustr.gov/about-us/policy-offices/press-office/press-releases/2018/september/ustr-finalizes-tariffs-200. 2 OECD. Trade in Services (indicator). 2019; https://doi.org/10.1787/3796b5f0-en, accessed January 7, 2019. 3 Lardy, N.R. "China: Forced Technology Transfer and Theft?" Peterson Institute for International Economics, April 20, 2018.